Auston Matthews has once again vaulted into the history books. After scoring his 35th goal of the season a dozen minutes into the first period of Tuesday night’s game against the Florida Panthers, the Toronto Maple Leafs centre broke Wendel Clark’s franchise record for rookie scoring. Clark set the mark in 1985-1986 when he put up 45 points, but Toronto was tumbling through the standings with a 25-48-7 record for a measly 57 points. The 19-year-old from Arizona has been lighting it up in Toronto and is a huge part of a young crop of players that includes William Nylander and Mitch Marner. Along with Matthews, the Maple Leafs could table up to three candidates for the Calder Memorial Trophy. That’s rather remarkable. As of this writing, Matthews leads the Maple Leafs in scoring with 62 points. He’s held the team in position to take its first playoff run since 2012-2013. And now he’s first in goals and points among all NHL rookies, with Winnipeg’s Patrik Laine right on his tail. 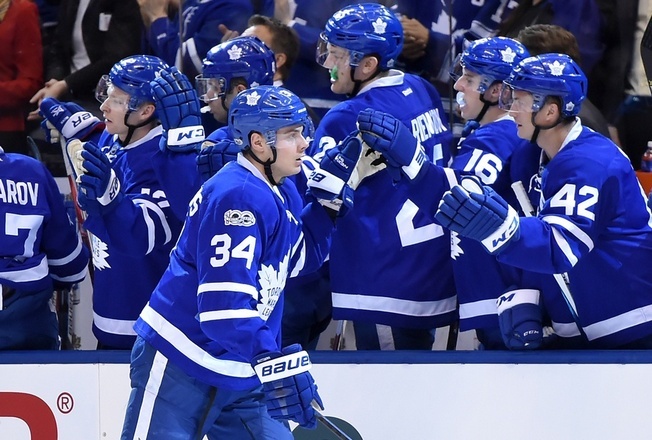 It is safe to say that the Maple Leafs took hold of a renewed destiny when they drafted Matthews first overall in the 2016 NHL Entry Draft, just as many thought they changed the tide when they drafted Clark first overall in the 1985 NHL Entry Draft. As Matthews hones in on Peter Ihnacak’s franchise record for rookie scoring, a total he’ll need just three more points to hit, his place in Toronto hockey history is assured. And if the Maple Leafs are able to take this playoff opportunity and run with it, his place in the hearts and minds of hockey fans will be undeniable.